Perhaps no two events shaped 20th-century America more profoundly than the Great Depression and World War II. 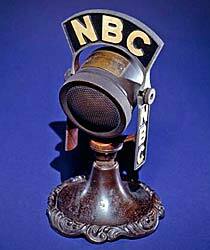 In this brief period, from 1929 to 1945, a generation of Americans faced terrible fears and achieved great triumphs. Their experiences would leave a lasting impact on the nation’s history and memory. 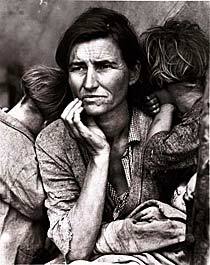 First published in a San Francisco newspaper, the poignant image became one of the most famous photographs of the Depression era, emblematic of the hardships suffered by poor migrant families. The “migrant mother,” anonymous for many years, was later identified as Oklahoma native Florence Thompson. 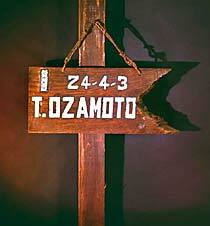 This sign identified the barracks residence of Michibiku Ozamoto, a Japanese American interned at Manzanar, California, during World War II. On February 19, 1942, President Roosevelt signed Executive Order 9066, authorizing the internment of people of Japanese descent in the interest of national security. Almost 120,000 men, women, and children, the majority of them U.S. citizens, were forced from their homes into detention camps. In 1988, Congress formally apologized for this violation of civil rights and paid restitution to surviving internees. 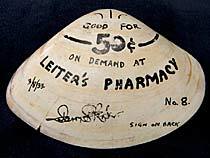 When the nation’s banks closed during the Depression, Leiter’s Pharmacy in Pismo Beach, California, issued this clamshell as change. The 1929 stock market crash triggered banking panics, as people rushed to withdraw their savings before they were lost. In March 1933, President Roosevelt ordered a four-day bank holiday to prevent further runs. To compensate for the currency shortage, communities created emergency money, or scrip. This clamshell was signed as it changed hands and redeemed when cash became available again. Artist J. Howard Miller produced this work-incentive poster for the Westinghouse Electric & Manufacturing Company. Though displayed only briefly in Westinghouse factories, the poster has become one of the most famous icons of World War II. As women were encouraged to take wartime jobs in defense industries, Rosie the Riveter became a celebrated symbol of female patriotism. 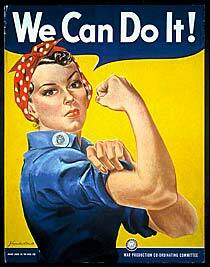 Yet when the war ended, many industries forced women to relinquish their skilled jobs to returning veterans. Combat photographer Robert Capa captured this arresting image of American troops landing at Omaha Beach on June 6, 1944. D day was the launching date for Operation Overlord, the Allied invasion of Nazi-occupied Western Europe. In one of the most complex operations in military history, U.S., British, and Canadian forces landed simultaneously on five separate beachheads in Normandy, France, and stormed through intense German artillery fire to establish a foothold. Three months later the Allies liberated Paris and began to close in on Germany.